Always the geek interested in little discussed aspects of the history of art, I bring you the art of a true pioneer! It took three centuries for some archeologists/art historians to become interested in the ruins of the ancient Mayan cultures of the Yucatan and Central America. Many Mayan cities were abandoned in the 14th and 15th centuries and most scholars are still not quite sure why. With the Spanish invasion and conquest in the 16th century and the suppression of native cultures, many Mayan cities became overgrown and forgotten. Ironically, it was western Europeans and Americans who led the charge to rediscover and excavate the glories of Mexico’s past. Frederick Catherwood studied architecture in London from 1815 to 1820. In 1821 he went to Rome and was important in documenting the excavation of ancient sites. During the following years his numerous travels took him to Sicily, Greece, Egypt, and Palestine. He worked as an architect in New York from 1836 to 1839. During the years 1839–1840 and 1841–1842 he joined the expeditions of lawyer and amateur archeologist John Lloyd Stephens (1805–1852). In 1839 President Martin van Buren commissioned Stephens as ambassador to Central America. Stephens subsequently – with Catherwood documenting – rediscovered the cities of the Mayan culture throughout Central America, starting in Copán, Honduras. 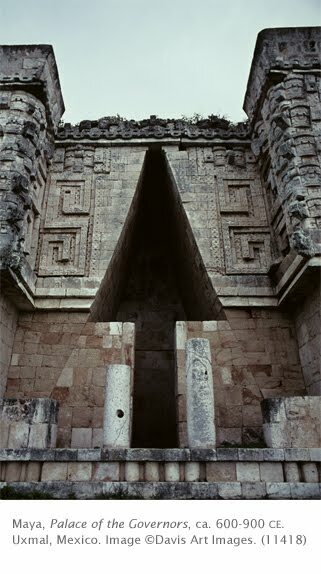 From there he and Catherwood explored and rediscovered Chichén Itzá, Uxmal, Palenque, and 40 other Mayan sites. 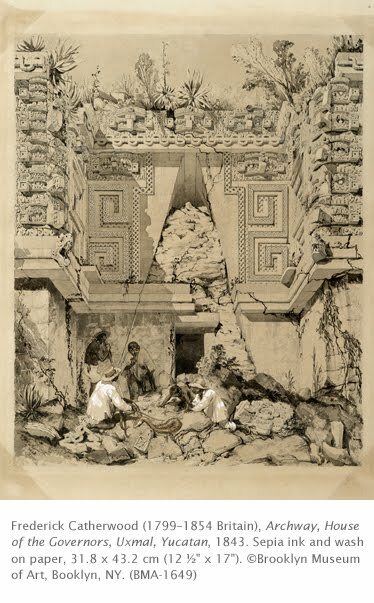 Catherwood’s detailed illustrations of monuments in each site, along wit h Stephen’s publications, spurred the excavation of numerous Mayan sites that had been ignored for centuries. 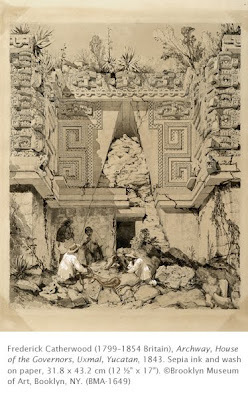 Catherwood’s drawings were translated into lithographs for “Views of Ancient Monuments in Central America, Chiapas, and Yucatan,” a portfolio of 26 lithographs that Catherwood himself chose and hand-colored. This view of the Governor’s Palace from Uxmal is one that became a lithograph in that portfolio. Compare it to the excavated building as it looks today! Correlations to Davis programs: Explorations in Art Grade 1: 1.1, Explorations in Art Grade 2: 6.31, Explorations in Art Grade 3: 4.21, Explorations in Art Grade 4: 3.18, Explorations in Art Grade 5: 2.12, A Personal Journey 8.1, A Community Connection: 4.2, A Global Pursuit: 9.2.